A month or so ago, I blogged about my desire to combat unnecessary landfill waste by finding more sustainable methods for getting a fashion fix. As I told y’all in that post, I tried out two of the biggest names in online second hand shopping: thredUP and Tradesy. So, how did they work out? My Tradesy order, a navy and white striped cap-sleeved Lilly shift dress, arrived within a matter of days. While I was pleased with the quick shipping, unfortunately the dress was a terrible fit — entirely too loose but simultaneously far too short for decency! Luckily, Tradesy has a lenient return policy, so I was able to exchange the dress for credit. So, I logged back in and picked out two summery Lilly tops. My thredUP order, on the other hand, took ages to ship. When I did finally receive the order, I found it rather odd that a company built on the principle of second hand sustainability would use oodles of tissue paper, filler, stickers, and pamphlets to stuff the shipped goods inside an unnecessarily large cardboard box. From thredUP, I got a pair of 7 For All Mankind denim shorts, a purple Lilly open-front sweater, and a pair of Lilly wedges. Last Sunday when I chose to do a little photo shoot of some of the items I bought, it was unfortunately too chilly for the shorts and wedges. I absolutely LOVE the pink one-shouldered ruffled top from Tradesy, and I felt that it paired perfectly with the purple cardigan from thredUP. This was the day that we went to go see Beauty and the Beast and meet my mother-in-law for a late lunch, so I dressed up my casual outfit a bit with my favorite Lilly bangles, my rose gold Kendra Scott necklace, and my gold leather Lilly crossbody. The ruffled top might just be my new favorite summer top. Between the rosy color and fun ruffles, this is just such a feminine piece. Knowing I saved something from a landfill makes it even sweeter! 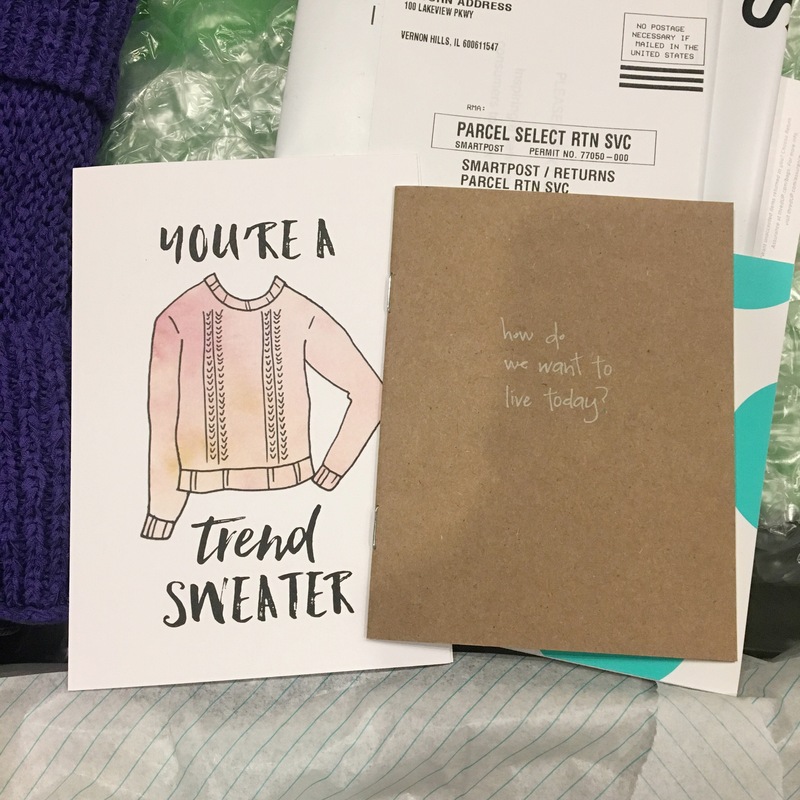 All in all, I would say that I am very pleased with both my experience with thredUP and Tradesy. The two companies are arguably different, but I enjoyed both. While thredUP is great for lower price points, the selection was not nearly as good, the shipping literally took weeks, and I could have done without the unnecessary paper waste in the packaging. Tradesy, on the other hand, has a much greater selection and lightning fast shipping (at least with the sellers I worked with), but the price points are quite a bit higher. Tell me, have you used either service, or another online second hand shop? Or do you prefer brick-and-mortar second hand shops? P.S. Huge shout out to my amazing husband for playing photographer!! I absolutely love that purple with the pink, and the pink, ruffle top alone is utterly darling! Aw, thank you, friend!! Believe me, the fear of receiving an item with smelly pit stains definitely crossed my mind a time or two. I’m relieved that, at least with this round of shopping, the fear was unfounded. And haha, I’m not cringing at all. I totally understand the need to shop new at times. Hell, I would honestly not order pants or jeans on one of these sights because fit is so unique to each retailer, and even then, some brands’ sizing varies wildly by the pant cut. I was wondering how this worked out. Love the pink shirt. Thanks for the update. (Take two, I’m hoping WordPress won’t eat my comment again….) I’m really interested in trying Tradesy now!! So many companies don’t allow Canadians in, but they do, and it’s exactly the kind of service I’m looking for. I’m looking for more investment pieces and less “right now”, and this is a great way to do it. I love that there is a verification system set in place, and everything seems pretty up and up from what I’ve seen. I love that cardigan!! Do you find that there are any categories that don’t have as many “finds”? Silly WordPress! I find it to be quite buggy at times as well. So far I haven’t found any categories that are lacking in ‘finds.’ I’ve searched for handbags, wallets (thinking of replacing my current wallet), sunglasses, and of course clothing. The only thing I think you might have trouble finding would be extra vintage-y pieces. But I tend not to go for vintage looks, so it’s not an issue for me. I’m not particularly into vintage items if I can’t see them in person before purchasing! I go for very classic pieces, but then again, those tend to be resold at quite a high price anyways so you might as well buy it new. I’m thinking of getting a clutch on Tradesy! I like this pink ruffle top. It’s full of feminine details. Pink color suits for spring! And the open-front sweater is also great. If it ain’t earth coloured or black with a hood on then I don’t wanna know! Haha. Seriously, I have a thing about hooded jumpers. They’re comfortable and I like the thought of being able to cover my head whenever the need arises. I’m the least fashion conscious person you’ll ever meet. I dig comfort over style in the main. I do like my quirky slogan t-shirts though (I’m presently wearing one that represents Darwin’s Theory of Evolution until you get to the last man who’s receiving an RKO and underneath it reads “OUTTA NOWHERE” in homage to WWE’s Randy Orton) and I have a thing about wearing boxer shorts with designer/brand names on them. Only my boxers though. I don’t care about any other item of clothing having names on. Weird! Hoodies are the best, aren’t they?? My favorite hoodie also has thumb slits at the ends of the sleeves, so that you can ensure that your sleeves never hike up. And that t-shirt sounds awesome!!! Did you design it yourself and have it made on one of those t-shirt websites? I want a hoodie with thumb slits! The one I’m currently wearing annoys me because the hood is perfect. Pull the strings and literally only my nose pokes out. It doesn’t have a front pouch though which massively frustrates me. I’ll let it off though as it’s a Jim Beam hoodie. I really couldn’t explain why I feel the need to wear designer name boxers, but nothing else designer. It’s been that way since I was about eighteen. Time was that I wouldn’t leave the house without my hair gelled in a messy spiked style, but nowadays I don’t wear product in my hair at all. My friend actually bought it for me a couple of years back. It was fitting that I should have been wearing the t-shirt on Wrestlemania day. Your description of your perfect hoodie hood makes me picture you as Kenny from South Park! But, a hoodie without a front pouch?! Blasphemy!